After thoroughly cleaning the car in Chapter Two, you should have a car that is reasonably pleasant to be around and work on. Now it’s time to get it into reasonably solid mechanical condition. The usual safety disclaimers apply: never work under a car that is not properly supported on ramps, jackstands, or a hoist. This list assumes that you have no information about the present condition of the car you bought. I’m also assuming that you bought a car that you want to drive fairly soon, rather than tearing it down for an engine swap or full restoration. Before you start the car, check the oil. If it’s not clean and fresh, change the oil and filter. Consider the manufacturer recommendations, age and mileage of the car, and the climate in which you live, and choose an appropriate oil. Use a good quality oil filter such as the OEM part, or a better-grade Wix, Hastings, Purolator, etc. If your car has a lot of deposits or gunk visible through the oil filler, you may want to use some Sea Foam or similar cleaner to loosen and flush out the contaminants. Follow the directions on the product. In most cases, the car should not be driven with these products in the oil, and you’ll have to change the oil and filter again after using the cleaner. Replace the air filter if it looks dirty. Replace the fuel filter if the car has been sitting for some time, especially if the car is carbureted. If you have an automatic transmission, check the ATF level (this usually means with the car running) and inspect the fluid for color and smell. If it looks dirty or smells burnt, replace it. If your transmission uses a paper filter, replace it when you change the transmission fluid. Some manufacturers (Toyota) put a drain plug on the transmission pan and use a metal screen instead of a paper filter in their automatic transmissions. On those cars, there is no reason to replace that screen, and no need to remove the pan to change fluid. Inspect all the radiator hoses, heater and bypass hoses, oil cooler hoses, and drive belts. Belts will usually show cracks or glazing (excessive shine on the driving surface) whereas hoses will start to swell, crack, or dry out. If anything looks suspect, replace it. Make sure any worm-drive hose clamps are tight. Check the coolant, and take a look inside the radiator to make sure there isn’t excessive corrosion. Replace the coolant if it’s not clean and bright, top it up if it’s low, and use the correct type of coolant for your car. If possible, pressure check the system if you can to make sure you don’t have a coolant leak somewhere. If you have to open the cooling system, you may well install a new thermostat. Most cars, Toyota in particular, work best with an OEM (Original Equipment Manufacturer) thermostat. They usually give much more consistent temperature control, better heat and defrost, and better drivability in all weather. On a rear-engine or mid-engine car, you absolutely must follow the correct coolant bleed procedure to get all the air out of the cooling system. There are no acceptable shortcuts. Failing to do this job correctly will result in severe engine damage. If the battery has removable caps, check the levels, and top up with distilled water. Take a look at the terminals and cables. Old cars often have loose, damaged, or poorly-repaired cables and terminals, so replace anything that isn’t up to snuff. I like brass marine-type terminals and cables with eyelets on the end because they are solid, and are easy to disconnect without tools. Clean anything you’re going to keep with a solution of baking soda and hot water, using a battery terminal brush to get the hard stuff off. Rinse it clean, dry it, reassemble it all, and finally brush on some battery terminal protectant or petroleum jelly to prevent corrosion from returning. Make sure you have a solid, reliable battery hold down in place. Now to get under the car. First, check for major fluid leaks, and repair them before going any further. If you have a manual transmission, check the gear oil level, and replace it if it looks or smells old. With a front-engine rear-wheel-drive (or 4WD) car, check the gear oil at each differential and transfer case. Some cars require special fluids in the drivetrain, and some just shift better with particular brands and types of synthetic gear oil. Do your homework and don’t cheap out if the car really does work better with a more expensive product. Give the driveshaft(s) a good twist to check for looseness in the universal joints, and lube them if they have grease fittings. Make sure any CV shaft boots look good and are not torn or leaking, or worse. Replace as necessary. Older cars are more likely to have cheap, worn out, or mismatched tires. Make sure yours are all the correct size, the same brand and model, and have decent tread depth and an even wear pattern. Tires also get old, and can be unsafe even if they look perfect. Read the DOT number, if visible, to determine when each tire was made. The last four digits indicate the week and year of manufacturer (for example, a DOT number ending in 4310 indicates a tire built in the 43rd week of 2010). Anything beyond ten years old should be replaced as soon as you can. If your tires are decent, make sure they are all inflated properly, at least to the pressures suggested by the car manufacturer. Read the owner’s manual. Do not try to outsmart the factory’s engineers if you do not have a solid reason for doing so AND the experience to make your own decisions wisely. Often neglected but very important. Make sure your wheel bearings are adjusted properly by jacking up the car until the wheels are off the ground (USE JACKSTANDS! ), then grasp a tire at the top and bottom and try to rock it back and forth. If there is significant play, verify that it is in the bearings rather than ball joints, then adjust the bearings if the car allows for it. Replace them if they are not adjustable. Replacing wheel bearings will also require new hub seal(s) in most cases. If not adjusting, at least pop the dust caps off and verify that the bearings are adequately greased. If your car has a steering box instead of a rack-and-pinion system, adjust the steering box. With the front wheels off the ground and the car safely on stands, try to get it just snug enough so that there is no play in the wheel, but no drag on it either. This can take some slop out of the steering but will not compensate for a worn-out steering box. Your repair manual will have more to say about this. While the car is in the air, inspect all the ball joints, bushings, and steering linkage. Lubricate anything that can be lubricated and replace anything that is loose or worn. For anything I drive, I like the tighter feel poly bushings give, and they never wear out or decompose like rubber does. Some MR2 footnotes: these cars have a tendency to wear out a plastic bushing in the steering rack. This makes a popping or cracking sound when the right front wheel hits a sharp bump, and shows up as vertical play in the rack gear or inner tie rod end on the passenger side of the car. The bushing is cheap, so replace it and its claw washer if necessary. MR2s are also prone to hiding ball joint problems. They can be totally worn out, but still look fine with the car on the lift. If your car wants to wander or dart around and all the steering components check out, replace the ball joints. This is another area where OEM really can be better, and often is not much more expensive than aftermarket. Time to get the wheels off and start getting dirty. Assuming discs at least in the front, visually inspect the pad thickness. Anything much less than 1/8″ usually calls for immediate replacement. Also check the rotors for grooving or other damage, and for thickness with a micrometer or at least a digital caliper. Replace them if they are close to or below their minimum spec. Check drum brake systems the same way. Verify that there is adequate material on the shoes and that the drum is below maximum internal diameter. Take a look at the brake calipers, brake master cylinder, wheel cylinders, clutch master cylinder, and clutch slave cylinder. If there’s any evidence of poor function, or of leakage or corrosion, rebuild or replace the parts as necessary. Toyota offers brake and clutch hydraulic rebuild kits that are very reasonably priced, and rebuilding hydraulics is not difficult. Adjusting drum brakes up nice and snug, so that the shoes just graze the drum as you rotate the wheel, does wonders for a drum braked car’s pedal feel and braking action. Check the rubber brake and clutch hoses for cracks and fatigue and replace anything that is not safe. Braided steel brake lines improve pedal feel and modulation over rubber hoses and often cost little more. Replacing brake and clutch fluid is a good idea, even if nothing else needs replacement, and your repair manual will tell you how to bleed the hydraulic systems. I like to use a pressure bleeder when possible. Inspect your parking brake cables. The rubber boots on them can fail, allowing the cables to freeze up in cold weather or get gummed up with dirt. Sticky cables can make it impossible to release the parking brake, so replace the cables if necessary, and adjust the parking brake to the factory specifications at the handle, pedal, or cable. Clean and lubricate the handle or pedal if it is not functioning properly. Make a note to test the brake’s effectiveness when you drive the car. Have an assistant try all the lights while you observe the car. Check the parking lights, low and high beam headlights, turn signals, emergency flashers, brake lights, license plate lights, side markers, and reverse lights. See that the horn works and that the wipers and washers function properly, and replace the wiper blades or rubber inserts if they’re not effective. Replace any bulbs and fuses that are burnt out and repair any wiring problems involving these systems. Visual testing of fuses may not be sufficient. Use a test light or voltmeter where necessary. Take the time to aim the headlights properly before driving the car on the road. Headlights that blind oncoming drivers or fail to light up the road for you are worse than useless. Dull or faded plastic headlamps can be polished and restored with a whole lot of elbow grease, some micro-fine emery paper, and a concoction involving Helmsman spar urethane…but that’s another write-up. As cars age, they are less and less likely to be kept in tune, and making all these adjustments can make a huge difference in the way an older engine runs. If your engine has mechanically adjusted valves, adjust them before tuning anything else. Note whether this is supposed to be done with the engine cold or hot. If the valves are to be adjusted hot, start the engine and warm it up to operating temp for at least ten minutes. Remove the valve cover(s) and set the valve lash as per your repair manual. Replace the valve cover cover gasket and grommets if there is any evidence of leakage, using sealant as and where instructed in your repair manual. Look at the spark plugs, plug wires, distributor cap and rotor, PCV valve, and vacuum hoses. If your car has them, inspect and adjust the distributor points using a dwell gauge. Replace anything that looks suspect. Be sure and gap the plugs to the correct spec, and use anti-sieze on the threads and dielectric grease in the plug boots. This makes it much easier to get the wires off the plugs and the plugs out of the engine in the future. Set the ignition timing once the engine reaches operating temperature. Make sure the engine is running at the correct speed given for adjusting the timing, and then adjust it. MR2 footnote: Make sure you have the diagnostic connector bridged as instructed in the repair manual. On cars with mechanical and vacuum advance mechanisms, timing is typically set with the vacuum advance diaphragm disconnected. Revving the engine with the timing light connected will show whether the mechical advance mechanism is still working properly – the timing should advance beyond base timing as the RPM rises. Applying vacuum to the advance canister (diaphragm) should also advance the timing. Both if these systems can fail over time. Repair them as necessary before moving on. 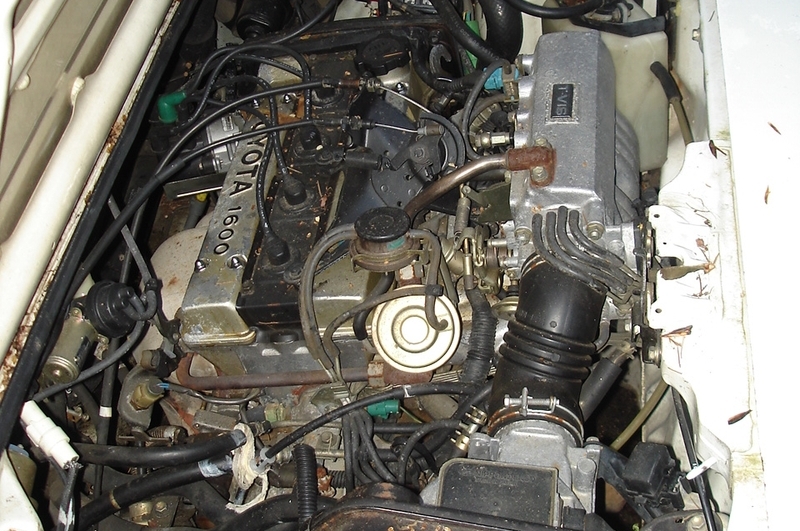 With ignition timing and valve clearance set, move on to the carburetor, if so equipped. Assuming it isn’t obviously in need of repair, give it a good thorough spray of carb and choke cleaner if it still has any gunk stuck to it. The linkage is your main concern here as it often gets gummed up over time. Work the linkage back and forth by hand several times to make sure that the throttle operates smoothly and closes firmly when you release it. On a fuel injected engine, clean the throttle body thoroughly. Do not use carburetor cleaner for this. There are commercially available throttle body cleaners that are more appropriate to the materials involved. Have an assistant hold the accelerator to the floor. Adjust the linkage or cable so that the throttle only or carburetor can still be opened just a bit by hand when the pedal is pressed against the floor. This reduces stress on the throttle cable or linkage. That last two degrees of open butterfly will not cost you any significant horsepower. Make doubly sure that the throttle return springs are in place and effective. The throttle body or carburetor should close fully when the gas pedal is released. With the engine at full operating temperature, set the idle speed according to your manual, then if so equipped, adjust the idle mixture screw. Adjust the idle speed screw again if you need to, double-check the idle mixture, and call it good for now. Valve lash and ignition timing are two things that are independant of other parameters. They should always be adjusted first, because they have an affect on carburetor or mixture adjustments. If your car is fuel injected, you probably won’t be able to adjust the mixture, but you should be able to do everything else listed here. Note: some EFI systems allow the idle mixture to be adjusted with a screw after a soft plug is removed. Don’t be tempted to play with this. There is usually no reason to touch it. Next chapter: Taking some of the old out of your old car.